Possible Future Conditions: pedestrian and cyclist friendly 'main street'. 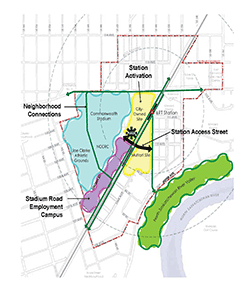 The City is preparing a Transit Oriented Development (TOD) land use plan that will help guide growth and change around the Stadium LRT station over the next 15 to 20 years. TOD at the Stadium LRT station will help the City become more compact and sustainable, make better use of existing infrastructure, and best of all, be very attractive to future residents. Visit the Council and Committee Meetings page for access to the agenda (available two weeks prior), bylaw reports or to register to speak at the Public Hearing. 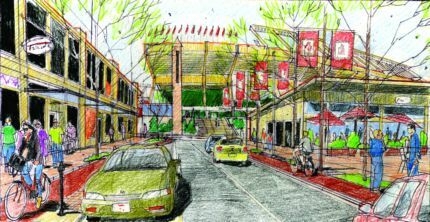 The project will extend ongoing revitalization north from The Quarters Downtown, offering increased vibrancy and safety within the framework of a new Stadium Station Area Redevelopment Plan (ARP). One of the major components of the new plan is a ‘main street’ running east-west across the LRT tracks just south of Stadium Station. This 'main street' will create a gateway through to Jasper Avenue, connecting new and existing housing with the LRT, Commonwealth Stadium, Community Recreation Centre, the river valley and Kinnard Ravine. The City is taking a collaborative approach with the development industry, and has entered into a cost sharing agreement with a private developer in the area for the ‘main street’ and other public infrastructure required to support the vision for TOD adjacent to the station. The cost-sharing agreement represents significant progress in the area’s transformation from an underutilized industrial area into a smart, walkable transit oriented community that will help catalyze development of adjacent properties, and make vital connections for residents and businesses. The private development will also create economic benefit for the city. Colliers International Consulting estimates it will generate almost $29 million in municipal property taxes during the development period plus residential property taxes of $4.55 million annually after completion. Careful consideration is being given to ensure both the cost-sharing agreement and private development proposals align with the vision, objectives and policies of the new Stadium Station ARP. Adopting the new plan will require amendments to the existing ARPs that apply to the Boyle Street, Cromdale, Parkdale and McCauley neighbourhoods. Thank you for attending our open house on April 20, 2017. If you weren't able to attend, you can still view the open house display boards (16MB) that were used. City Council approves the proposal to rezone the parcel of land owned by Brookfield Residential on the east side of the LRT tracks, formerly known as the Muttart Lands site. Executive Committee approves the city's proposal to enter into a cost-sharing agreement with Brookfield Residential for public infrastructure related to the implementation of transit oriented development in the Stadium LRT Station area. The city hosts a public meeting to give residents and businesses the opportunity to provide feedback on Brookfield Residential’s application to rezone the Muttart site. The proposed rezoning is to accommodate a transit oriented community consisting of mixed density residential and neighbourhood commercial buildings ranging from 14 to 120 metres tall, and two pocket parks. Administration presents a report to Executive Committee providing an update on efforts to implement TOD in the Stadium Station area, and The Quarters Community Revitalization Levy (CRL). Council allocates $14.127 million ($5 million from the Quarters CRL and $9.127 million in pay-as-you-go funds) towards the construction of infrastructure in the area. Expenditure of the funds is subject to a report to Executive Committee giving a financial update on the project, including the cost-sharing arrangement with Brookfield Residential. Executive Committee discusses a variety of options for TOD in the Stadium Station area. Thank you for attending our open house on April 20, 2017. If you weren't able to attend, you can still view the open house display boards (16MB). A revised draft Area Redevelopment Plan (ARP) reflecting your input and the necessary ammendment to adjust the ARP will be presented to City Council at a public hearing later this summer. Edmontonians can share their views directly with members of City Council by requesting to speak when the plan advances to City Council Public Hearing.